grandma's cookie jar: just for fun - 32 Ideas for Backyard Fun! My grandsons have birthdays in July, August and September, so I've been watching for ideas for fun things we could do at a party (since I have a large yard, their momma and I have been thinking about having their party here this year). Today when I browsed on Pinterest I found a link for not just one or two great ideas, but 32 ideas! And, they are excellent, doable and fun ideas! Follow this link and you'll find links for the specifics for each of the 32 ideas. 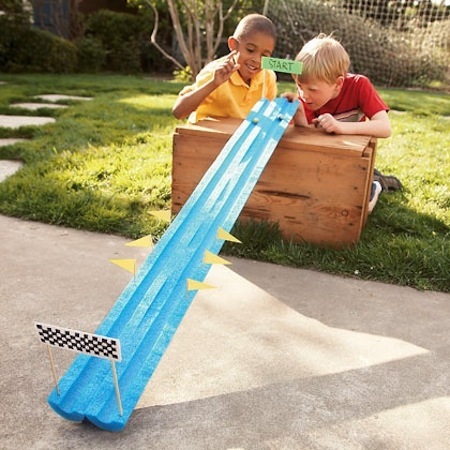 I'm leaning towards using the ideas for the marble race, Nature Scavenger Hunt and Backyard Obstacle Course! Lots of fun for sure! Which ideas do you like the best? Enjoy!